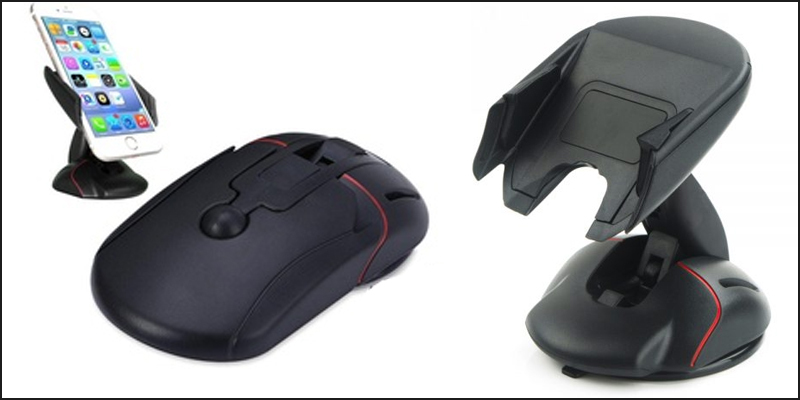 Computer mice hydraulic transmission design mobile holder, it’s easy to carry and easy to install in. Automatic deformation with just one click, convenient to use. You can turn your phone up to 360 degrees rotating foldable mouse mobile holder. The width of the holder is adjustable from 5 to 9cm (1.97inch to 3.54inch). Compatible with all mobile phone devices from size 5.5-9.5 cm. Powerful suction cup sticks to dashboard, windshield and most other surfaces. It is elegantly design with modern and graceful appearance. It’s suitable for both who want a mobile phone holder and who ma want a stand to watch their favorite shows, plays, movies etc. It can also usable at homes for watching TV shows, Plays, Dramas, Movies etc. Its long suction cup handed shock resistant and design for effortless positioning. Strong Grip due to its adhesive sticky gel pads holder. The cell phone holder is made of high quality material and strength. Softly presses the arms automatically open without difficulty, rapidly remove the machine. Its design is for all who are using an android, iOS, Samsung or Windows Smartphone’s car phone holder is definitely for you.